Teresa Ann Virginia is an energetic soul looking to share new ideas by revamping the old ones. She generates space to inspire innovation. MEET TERESA- As a theatre maker, Teresa is dedicated to crafting whimsical, provocative mixed media performances, often deconstructing gender and the feminine. She intends in each piece to create a unique visual world for the audience to enter, and an experience in which the familiar becomes strange and the strange melds into the familiar. She tells stories through rhythmic language and sounds, puppets, projections, classical and contemporary dance, and performance and anthropological theory, living in the intricate details that have the power to transform the theatrical experience. 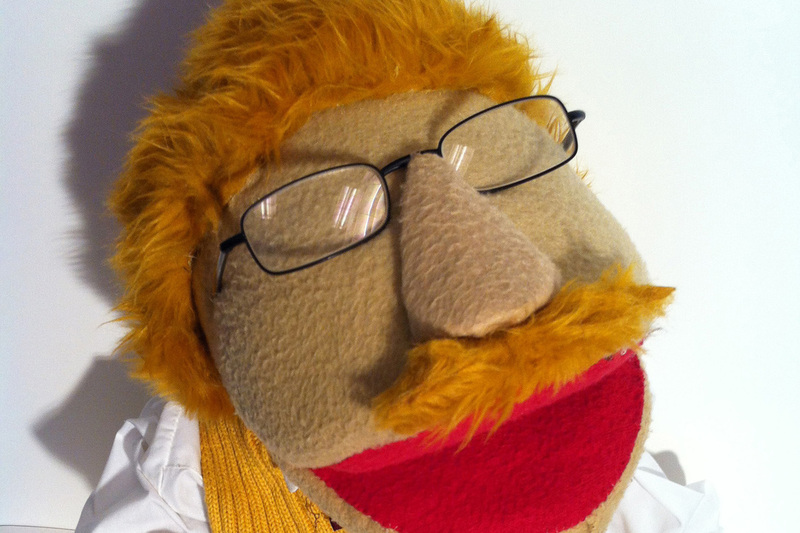 HAND CRAFTED "MUPPET-STYLE" PUPPETS ON ETSY! Last seen at ARTISTS & FLEAS in Williamsburg, Brooklyn! Fall 2013: Teresa assisted Costume Designer Tilly Grimes this past fall for ArsNova's Eager to Lose and worked as a stitcher for New World Stages' Iluminate. Spring 2013: Teresa graduated in May 2013 with her Masters of Fine Arts in Performance from the University of Maryland, College Park. Teresa also recently directed the Johns Hopkins University Barnstormers' production of Sweeney Todd: The Demon Barber of Fleet Street! Look at pictures HERE! PRESCHOOL! a pint-sized musical , a collaboration with Zoe Farmingdale, directed by Michael Gilbert won Best Song - "The Peanut Butter Song", Best Original Lyrics, Best Original Score,, Best Original or Adapted Script , Best Direction, and Best Musical in SERIES C (Workshop) at the West Village Musical Theatre Festival. Zoe & Teresa are currently expanding the piece. Teresa also interned in the summer of 2012 at New Georges, where she assisted costume designer Tilly Grimes on Motel Cherry (co-produced with Clubbed Thumb) premiering at HERE in Manhattan. 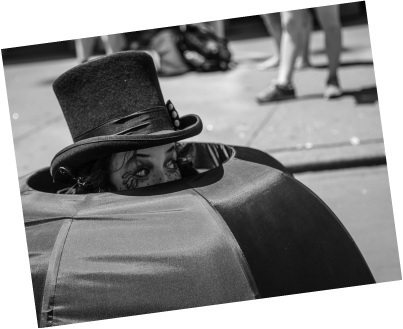 SHE also spent a great deal of time in Times Square, as an umbrella named BUBBLES, "clowning" around, as a part of Cirque du Soleil's ZARKANA Street Team. She loves to hide in her umbrella and misses it. Beyond that, she writes. crafts. designs. analyzes. builds. produces. performs. studies. Teresa has embarked on the grandest adventure- BUSINESS SCHOOL! She is currently developing the skills that will allow her to effectively implement change in the management of human capital across a broad range of industries. She is proud to call herself a Longhorn (Hook 'em!). COFFEE AND BISCUIT recently rocked out at HERE as part of their Co-Op Series. They had a blast. Next year, the team will be taking the project to new heights. Stay tuned for more information and check out some of our reviews from our performance as part of the New York International Fringe Festival this past August. "Farmingdale... [gives] the finest dramatic performance I've seen from an actress at the festival." 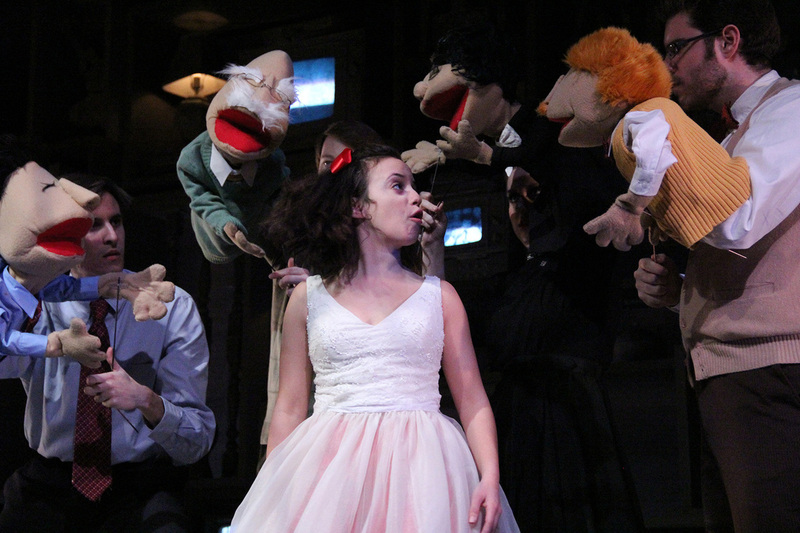 This past August she presented at the National Puppetry Festival's Critical Exchange, speaking about feminism & puppetry (two of her favorite things). Teresa played at Alphabet Arts' Puppets & Poets at the Bushwick Starr in December and at the Puppet Cabaret Monst(e)rous Edition. Teresa had a marvelous short residency this past summer in France, where she developed and performed a short solo piece inspired by Ibsen's A Doll's House . Teresa recently collaborate with TJ Burleson (pictured above) on a new costume/ choreography/ burlesque/ drag project. Check out the pictures from Fresh Ground Pepper's OBJECT at Littlefield, April 13th, 2014. There were plastic bags involved. Stay tuned for more news on the future of this project. In January 2014, Teresa collaborated with the amazing Zachary Huckel-Bauer, to craft puppets for his song PARADE OF BIRDS. Photos will be up soon. 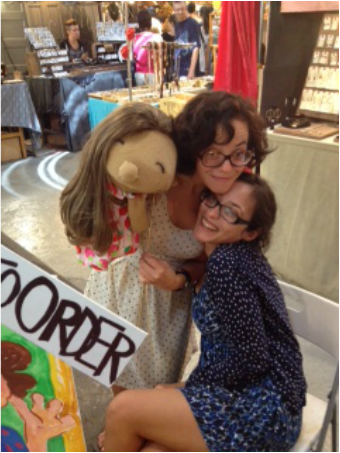 Teresa also played with the brilliant Zoe Farmingdale to bring to life an amazing and distinctly Zoe story. Stay tuned for the animation. There are more awesome collaborations on their way. Let me know if you want to play too! COFFEE & BISCUIT at UMD!